Let’s just get this out of the way. 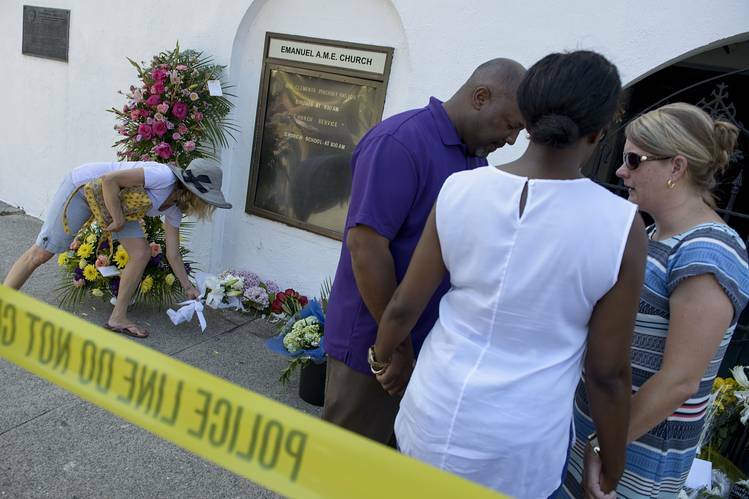 The mass shooting in Charleston, SC was horrific, tragic, and totally unnecessary. It was an act of terrorism, done to inspire fear, born of hatred and disrespect and entitlement. But Dylann Roof is not mentally ill. Anyone who looks at this event and blames one person’s [nonexistent] pathology is desperately trying to avoid addressing the systemic issues that cause these shootings. The United States has more mass shootings than any other developed nation. What is it about living in the United States that leads [white] people to kill those [blacks and browns] they hate? Our personalities and our actions are products of our environments, the barrel of vinegar we’re soaking in from birth. We live in a poisonous barrel, full of slavery’s legacy, white supremacy, stigma, loss, anger, but also fights for freedom, respect, civil rights, forward motion. We live in a place where black lives are routinely and historically devalued. We live in a place where guns are ridiculously easy to get (and can be made at home or printed out). Mental illness has nothing to do with this. People with mental illness are much more likely to be the victims of violence than the perpetrators. The vast majority of folks struggling with mental illness struggle with anxiety and depression. Mental illness doesn’t make a murderer, any more than running shoes make a track star. Looking at Roof as a mentally ill lone gunman entirely misses the point. It’s lazy, factually incorrect, and perpetuates stigma that costs thousands of people struggling with mental illness their lives each year. It’s not the person, it’s the person as they function within the system in which they live. Dylann Roof learned that violence is an acceptable answer to dislike, misunderstanding, imagined wrongs and hatred. He learned that black people won’t be as much of a loss as white people, that they are naturally inferior to his white skin, that they are inherently violent, that they are inherently them and not us. It was this learning that led to this shooting – he learned it would be fairly okay, that this was somehow acceptable loss. A caller to On Point this morning talked about living in the south; he said there were people there who would probably not see these shootings as tragic or horrifying, rather something to glorify. This is a cultural issue as well as a personal issue – this was the barrel Dylann Roof was soaking in. Don’t get me wrong – I’m aware it’s “not all white men” and “not all Southerners” and “not all young men” et. al. But the combination of this personality and this toxic environment led to tragedy, and now nine people are dead. Stop blaming these massacres on mental illness. Blame them on our toxic culture that allows hatred to flourish, then kill.